With Sharper Image promo codes and discount coupons, it is easy to get instant discounts or deals like free shipping. Whenever you want to buy an innovative gadget like the Ionic Breeze or a unique gift, check this page to look for Sharper Image promotion code deals, special sales, and other discounts. Geeks are sharp in more ways than one. We have great intellect, but we also have unique style. It could be said we maintain a “sharper image” than most. That may be why so many geeks like to shop at www.sharperimage.com. Or maybe it’s just all the cool consumer electronics. The Sharper Image Corporation had humble beginnings as a catalog business that sold jogging watches. After its founder Richard Thalheimer made his first million in the company’s first two years, he decided to shake things up a bit and expand Sharper Image’s product offerings. Today, at sharperimage.com, customers can find great gifts for gadget lovers. Make your home more breathable with one of Sharper Image’s many air purifiers, from the Ionic Comfort Compact Air Purifier to the coolly designed, space-like Water Globe Air Purifier and Air Freshener. Want something with the sleek look of a desktop CPU? Try the Oransi V-Hepa Air Purifier. Do you have code running through your head when you try to sleep at night? Block it out with a SoundSoother white noise machine after relaxing before bed with a Pedicure Spa Salon Footbath. Is it your significant other who has trouble sleeping? Then maybe you could use a Sona anti-snore pillow (hint-hint). Here’s a gadget a geek’s gotta love – the motorized tie rack. Of course, maybe you work from home and don’t have to wear a tie; then why not transform your workstation into a massage parlor while you toil at the computer with a 10-motor massage chair pad? Sharper Image has highly unique gadgets such as the Digital Note Taker, which looks like a pen but really wirelessly captures everything you write or draw on paper so you can store it in your computer. Bit of a germaphobe? Or do you just have sniffly, runny nosed kids who are constantly asking to play with your iPhone? Sharper Image has created the first ever UV cell phone sanitizer, and it’s a top seller. Here’s something computer specialists really need after hours in front of the screen – the “I See Eye Massager.” This one-of-a-kind gadget is designed to relieve your tension and the strain on your eyes and head after a day of computer work. Find all sorts of unusual gear, from digital camera binoculars, electric salt and pepper mills, portable scanners, wireless stock market monitors, electric wine openers, and ePen electrolysis systems. You can even buy a classic Pac Man Arcade machine. Now that’ll look cool in the apartment. Pop on over to the electronics section of the website for MP3 players, docks and accessories, media converters, digital photo frames, chargers, headphones, clocks, radios, speakers, and electronic games and toys. There you’ll find video glasses, pocket projectors (not protectors, PROJECTORS! – overcome that stereotype! ), digital video pen cameras, keychain video cameras and recorders, and much more. 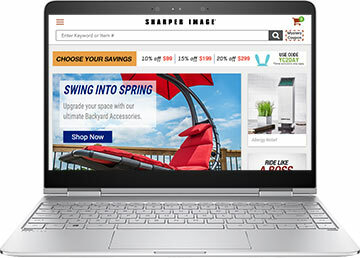 Sharper Image also stocks tech clothing, telescopes, binoculars, golf gear (including a Golf GPS), outdoor grilling equipment, body massagers, men’s and women’s personal care items, pain relief products, and fitness equipment.